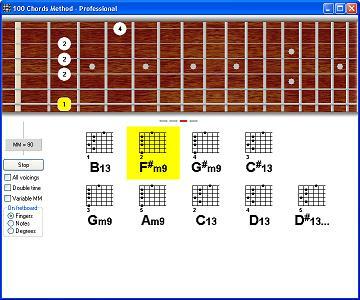 The 100 Chords Method is a multimedia training software that will make you a master of guitar chords, fluent in all keys, and at home anywhere on the fretboard. Effective and enjoyable play-along exercises will train your fingers, your brain, and your musical ear. Fluent in all 12 keys -- While many guitarists only feel comfortable in some "easy" keys (C, E, A, etc. ), after completing the course you will be equally fluent in all 12 keys. If you learn a foreign language, you don't want to know isolated words, you want to speak fluent and free.... In the same way, this course is not a dry list of chords -- this course makes you fluent with chords! Whole fretboard mastered -- If your playing tends to be confined within only a few frets, this course will expand your range and make you a master of the entire fretboard. All the exercises mercilessly force you to use the entire fretboard! Only then will you be able to play effortlessly anywhere and create all the musical effects you want. Rich chord vocabulary -- Your musical freedom depends on your musical vocabulary. The richer your vocabulary, the more you can express. The course will dramatically expand your chord vocabulary so that you will always know several ways of playing any chord and the effect produced by each. 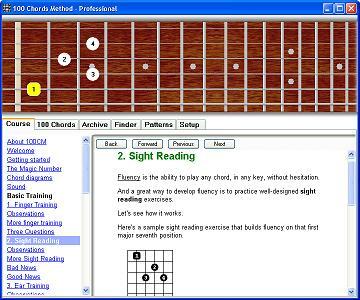 Effortless sight-reading -- You will be able to take a look at any chord chart and play it correctly right away. Great "snap" -- "Snap" is the technical ability of your fingers to quickly snap into any chord position and produce a clean sound without fumbling. Groove: playing with great time -- If you are not satisfied with your rhythmic skills, the 100 Chords Method play-along exercises will tighten up your time and train your brain cells and nerve fibers to produce a great groove every single time you strum a chord! Superior technique by effortless concentration -- Good technique means getting a great sound effortlessly and consistently. The 100 Chords Method exercises make your technique superior by conditioning your muscles to play with effortless concentration, without avoidable errors and fumbling. If you tend to make errors on easy passages -- e.g. you play the same passage sometimes well and sometimes poorly -- the 100 Chords Method exercises will dramatically improve your playing right away. Fine musical ear -- You will develop the ability to recognize the chords you hear, to hear a chord in your mind before you play it, and to listen to a song once or twice and know right away how to play it. 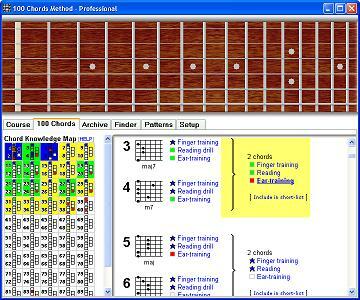 Guitar chords mastery is the combination of all these skills. In practice, the 100 Chords Method's training strategy helps you develop these skills fairly easy and quickly(*) through a variety of multimedia play-along exercises. (*) Note: all the skills above can be developed very quickly, within a few weeks, with one exception: the development of a refined musical ear is a gradual, long-term process that takes months and years. Would you like to know the secret of the greatest players? The secret is not practice. The secret is effective practice. There are a lot guitarists who practice, practice, practice... and still sound the same, month after month, year after year. Why? Because their practice is not effective. They spin their wheels without going anywhere. But when you practice effectively.. that's when you make real progress, sometimes dramatic progress. The 100 Chords Method is like having a top-notch personal guitar teacher at your disposal, 24 hours a day. Whenever you want to practice, it is there to guarantee you achieve maximum progress from every minute of playing. One of the secrets of highly effective practice is to measure your progress and use that information to guide your training. And the 100 Chords Method does just that. After every exercise, the 100 Chords Method software memorizes your performance and then combines all that information into your personal "Progress Map". Day after day, the progress map then helps you to always do the right exercise at the right time. That means achieving maximum benefit from every minute of practice, because you are always training "in the zone". And of course that means achieving superior chords knowledge and mastery within a few short weeks of regular practice. The 100 Chords Method is an extremely effective training method, but it doesn't perform miracles. If you want serious results, you will have to practice regularly. If you don't want or cannot practice regularly, or if you only want to learn a song or two, that's absolutely OK, but please look elsewhere, don't put your money and time into this course, because it's not for you. But if you love guitar and are prepared to put some serious practice into it, then the 100 Chords Method will be a tremendous asset and give you not a miracle but the next best thing: spectacular returns on your investment of time and energy. If you are an ambitious guitarist and you want superior skills, chances are you will thoroughly enjoy the 100 Chords Method's take-no-prisoners approach, and you will achieve dramatic improvement within the next few weeks. Download the free trial version of the 100 Chords Method. When you're ready to go all the way, order 100 Chords Method PROFESSIONAL and start mastering all 100 positions once and for all. Give it a serious try. If it's for you, you will know it.